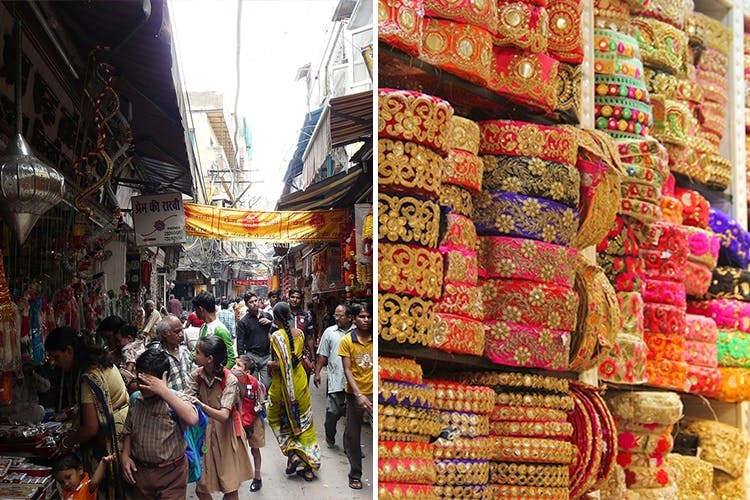 With its numerous markets offering everything from books and stationery to saris and silver jewellery, Old Delhi is any shopper’s paradise. It’s also a place that can be confusing to navigate, but if you know exactly where to head (and for what kind of products), old Delhi shopping can be a lot of fun. That’s exactly where our guide to old Delhi’s bazaars will sort you out. Bhagirath Palace is Asia’s biggest wholesale market for lamps and light fixtures, so if there’s one place you need to hit up for affordable (but stunning) lights in Delhi, this is it. From steampunk lamps and vintage chandeliers, to cafe-type lamps and even 35 rupees fairy lights, this market has it all – and you’ll love the variety too! Kinari Bazaar is the city’s fabric DIY heaven. It’s got numerous shops offering sequins, zari borders, latkans, buttons and everything else that you need to deck up an old outfit. We also managed to find a store here that’s got cute potlis and pouches – perfect for wedding favours and gifts. Just off Kinari Bazaar, there’s also a cluster of nine, teal-coloured havelis called Naugraha. These are basically khandani-looking jewellery stores where you can find lovely silver jewellery starting at INR 1,000. Find more info here and here. Oh, and drop by Padam Chaat Corner too. Chawri Bazaar is a wholesale market for brass and copper articles, and wedding invites. This market has got rows and rows of shops with wedding invite samples, including the ones in the most basic colours and styles, as well as fancy (and obviously, some garish) ones with music, lights and the like. While you’re there, be sure to drop by this hidden vintage store that’s got working gramophones at INR 2,000! Kuremal Kulfi and Shyam Sweets (for the best bedmi puri & nagori halwa) are other pit stops that will make your trip to Chawri even better. Asia’s largest wholesale spice market, Khari Baoli is located at the west end of Chandni Chowk. It’s a veritable world of spices, dried fruits, nuts, aam paapad and even the most exotic spices and condiments you probably wouldn’t find anywhere else, at affordable rates. Plus, most of the shops here are almost centuries old and the owners would have a lot of interesting tidbits to share related to the spice trade and different spices. If you have a sensitive nose, be sure to carry a mask or an extra scarf, because the smell of spices can get overwhelming. Love silver jewellery? You definitely have to check out Delhi’s very own silver jewellery market, Dariba Kalan. In this 17th century market, you can score beautiful silver pieces for at least 25 percent less than what you’d find at most stores in Delhi. From 92.5 sterling silver rings to heavy necklaces, or even simple nose rings, Dariba Kalan is a treasure trove of all things silver. Going all the way to Red Fort on a Sunday (and that too at 6am) is a task, but Chor Bazaar is just the kind of place that deserves all that effort. As the name suggests, it’s a market where you’ll find a lot of stolen and duplicate products, all of which are pretty much sold out by late afternoon. Reason? Well, when you can get Zara, Clarks, Steve Madden and TopShop shoes and clothes, at just around INR 600, one can expect all of this to be gone within a couple of hours. Antique cameras, carpets, screwdrivers and even sports goods are some other things you can find here. Ballimaran is a popular market known for its variety of optical shops. In the tiny shops cramped one next to another, you’ll find some of the most affordable spectacle frames and sunglasses. While we cannot guarantee that they’ll all be good quality frames, we do know that everything’s priced affordably in Ballimaran, and that most optical stores across Delhi NCR purchase frames in bulk from this market. Shop for: Spectacle frames and sunglasses. Once upon a time, Katra Neel was famous for its indigo cloth traders. Now, it’s a lot more than just indigo. This market has got stores offering cloth material and bling-y readymade wedding clothes for both for men and women. The best part about this market is that the cloth material you’ll find here is of impeccable quality and is also priced ridiculously low. Don’t believe us? Well, we made a trip here and found that you can get a two-piece linen suit stitched for just INR 4,000! Also known as the photo market, this place is any photographer’s dream come true. It’s got stores retailing everything from vintage cameras and the latest DSLR models to rolls of Kodak Film, SD cards and tripods. When here, know exactly what to buy and where to find it with our handy guide. Chatta Chowk, also known as Meena Bazaar (Jama Masjid also has a tiny Meena Bazaar Market), is the passageway near the Red Fort with a line of shops selling shawls, memorabilia, jewellery and even diaries. Back in the day, it was meant to be an imperial bazaar for royal women but today, it’s more a bazaar for tourists. Since these shops are mostly meant for souvenirs, the prices will be higher than the usual. Nai Sadak is the connecting street between Chawri Bazaar and the main Chandi Chowk market. This particular lane is our favourite, because it’s lined with shops selling the coolest stationery and books, all at affordable prices. Colourful wrapping paper, cute Post-Its, Sakura Pigma imports, quilling paper and matte tapes are among the many things we found in this market. There’ll be numerous stores selling second-hand novels and college books too, for at least a 15% off on the MRP. Sadar is a wholesale market for well, a lot of things. You can find everything from artificial jewellery and plastic toys to household goods like crockery and storage boxes, as well as a few stores selling readymade women’s garments. We even found a hidden lane in Sadar full of the craziest party supplies we’ve ever seen (think neon ice cubes, Modi masks, hanging bodies and more).